What's this L.A. cougar thing? Is this the chick with the P-22 tattoo? If I Google Beth why does "pika & poop" come up in the results? My mother tells me my interest in wildlife began at an early age. I would collect frogs in a bucket, name them all George, watch them in a special frog habitat I constructed in our backyard, then release them to their “families” at night. “There are some who can live without wild things, and some who cannot,” said legendary conservationist Aldo Leopold. I am one of those people who cannot. I consider myself the luckiest person in the world to have the role as California Regional Executive Director for the National Wildlife Federation, and to work with amazing people to protect the state's remarkable wildlife--from mountain lions in Los Angeles to porpoises in San Francisco Bay, to pika in the Sierra Nevada. And as to that pika feces reference, my most notable contribution to science to date involves documenting a pika eating marmot poop. Most of my almost thirty year environmental career has been spent in national parks, and in two of the largest—Yosemite and Yellowstone. I’ll always be a national park advocate, and Yosemite remains my favorite place on earth. But I now focus most of my work on helping wildlife in cities and just finished a book about it, When Mountain Lions Are Neighbors. Just ten years ago, while listening to a wolf howl or grizzly bear lope by in the wilds of Yellowstone, I would have laughed hysterically if you had told me I’d soon be dedicating my career to the conservation of wildlife in cities like Los Angeles. How did I become an advocate for urban wildlife and LA cougars (of the cat kind)? In 2012, I read a headline in the Los Angeles Times, “Mountain lion makes itself at home in Griffith Park,” that radically transformed my life’s work. At the time, I thought it simply a curious story that defied plausibility at first glance. How could a mountain lion be living in the middle of the second largest city in the United States? And why would the poor cat even want to? After a day spent tracking P-22 in Griffith Park with Jeff Sikich, the National Park Service biologist who studies the cat, I had a life changing epiphany. This cat has more of an imagination than I do. Why can’t a mountain lion live in a city? Why is the human built environment seen as off limits to wildlife? If it’s good enough for a mountain lion, who are we to judge? P-22 shifted my perspective and his remarkable story of crossing two of the busiest freeways in the country to find a new home, as well as his ability (and those of his Santa Monica Mountain cougar kin) to adapt to life in a challenging urban interface in order to survive speaks to the beauty and resiliency of wild things. This inspired me to act--I wanted to help these animals survive. And from that inspiration #SaveLACougars was born--the collaborative campaign to build the largest wildlife crossing in the world over one of the busiest freeways in the country to help save a population of mountain lions. And P-22 also inspired me to get my first tattoo at age 46. What I love about my work with the National Wildlife Federation and our partners is how it transforms people, myself included. As someone who spent most of my career working in remote wilderness areas, my main conservation priority is now focused on urban wildlife conservation and creating co-existence strategies in our human spaces. The future of conservation is about the integral link between wildlife and people – and cities are vital to forging those links. Join me in my celebration of the wonder of all California wildlife--whether in a city, a rural town, or somewhere in between--and in my efforts to protect and coexist with our wild neighbors. A lifelong advocate for wildlife, Beth Pratt has worked in environmental leadership roles for over twenty-five years, and in two of the country’s largest national parks: Yosemite and Yellowstone. As the California Regional Executive Director for the National Wildlife Federation, she says, “I have the best job in the world—advocating for the state’s remarkable wildlife.” Although most of her career has been spent in national parks, she now focuses her work on helping wildlife in cities. 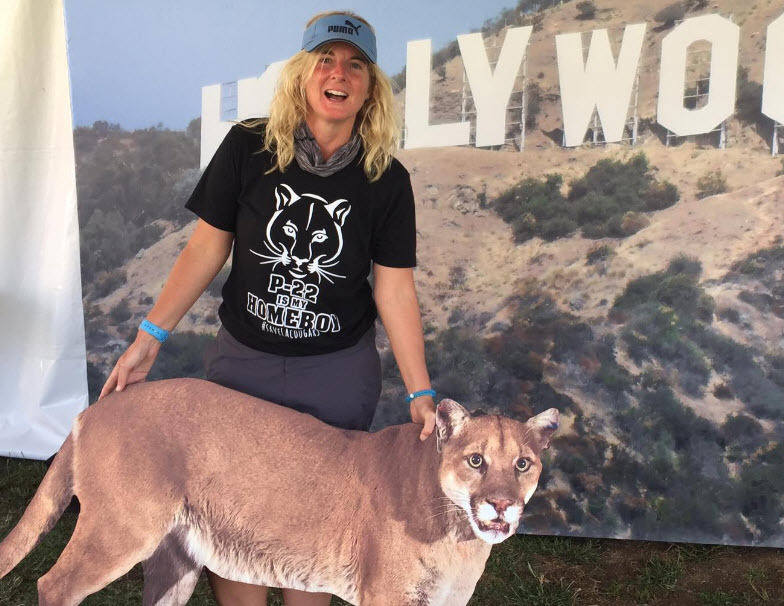 Beth also leads the #SaveLACougars campaign to build the largest wildlife crossing in North America—and potentially the world—to help save a population of mountain lions from extinction, and her conservation work has been featured by The New Yorker, The Wall Street Journal, Washington Post, BBC World Service, CBS This Morning, the Los Angeles Times, Men’s Journal, and NPR. Beth obtained a BS/BA from the University of Massachusetts, an MBA from Regis University, earned the LEED AP credential, and trained with Vice President Al Gore as part of his Climate Reality Leadership Corps. In 2007, she traveled to Japan as part of a month-long Rotary International Professional Exchange to study business and national park operations. Her book on urban wildlife conservation, When Mountain Lions are Neighbors: People and Wildlife Working It Out In California, was published by Heyday Books in 2016. She has given a TEDx talk about coexisting with wildlife called, “How a Lonely Cougar in Los Angeles Inspired the World,” and is featured in the new documentary, “The Cat that Changed America.” Beth spends much of her time in LA, but makes her home outside of Yosemite, “my north star,” with her five dogs, two cats, and the mountain lions, bears, foxes, and other wildlife that frequent her backyard.